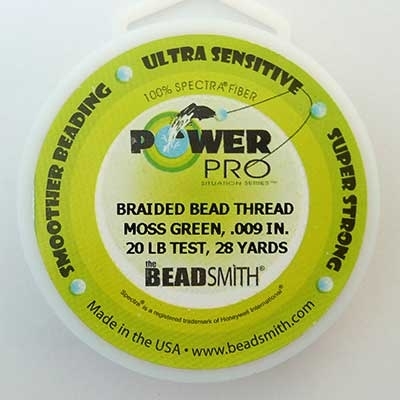 - Made of 100% Spectra Fiber, strong as wire but is actually a thread. - Non-Stretchy and knots easily. - Available in two colors: Moss Green (appears almost Black when used) and White. - 20-lb. Test Size requires 20 pounds of pressure to break it. - 28 yards per spool. - Works with a size #10 Beading Needle or a Big-Eye Beading Needle. - Does not cut easily with standard scissors. Cuts best with our WESTCOTT 5" Titanium Bonded Micro-Tip Scissors.